Our full-day Tricity tour is an unbeatable offer for anybody wanting to explore the exciting Tricity in one day. It makes for a day full of contrasts and enjoyable sightseeing. Car transport is imperative for this tour, because Gdansk sights are spread over a very large area. What we can ensure is great guides and a flexible service – you have an impact on what you would like to visit. If you want a shorter tour that excludes some of the top places, please contact our office for a quote. The tour starts in the historical area of Gdansk, where you will have an opportunity to see the old harbour with the Crane Gate – Gdansk’s the most characteristic building. The walk will continue to the Long Market with its Neptune Fountain and the Artus Court, a former meeting hall of the merchants in the times of the Hanseatic League. You will also see the Main Town Hall with the famous Gdansk carillon, the magnificent Arsenal, the Millenium Tree, St. Mary’s Church with its astronomical clock and many other beautiful sights of Gdansk. You will be able to walk along Mariacka Street, famous for its charming terraces full of amber jewellery. Further on we will stop at the monument to the Shipyard Workers – in Solidarnosc Square – starting point of the battle for democracy in Europe. Heading off in a northerly direction towards Oliwa, we will travel through the Wrzesc district where Guenter Grass, the Nobel Prize novelist, was born. In the historical Oliwa district you will see the house of Lech Walesa, electrician and leader of the Solidarity movement, later president of Poland in 1990-1995. In Oliwa cathedral you will have an opportunity to listen to a short organ music concert. You will continue to the beautiful and famous Baltic seaside resort of Sopot, where you will have time to lunch or take a coffee break and have time to breathe in Sopot’s great atmosphere. If you wish, our driver can also take you to the Forest opera, the place where Poland’s most popular music festival takes place, or climb the central lighthouse to admire Gdansk Bay from above. The next step is Gdynia – the leading Polish port with its sailing ship “Dar Pomorza” and battleship “Blyskawica”. 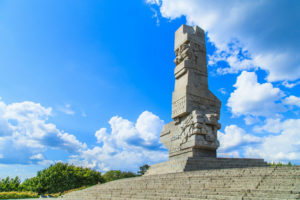 On the way back you will stop by the Vistula River estuary to see the Westerplatte Monument, erected in the place where World War II started. Westerplatte is a symbolical place commemorating the heroic defence of Poles against German invasion in 1939.
we were not lucky with the weather, so the trip to Sopot was little bit too weather exposed. Tour itselv was very good - especially the Oliva Cathedral will be remembered. A very informative and fun day ;the weather was good and so we paddled in the Baltic, strolled the pier and generally had a wonderful day. Individuell tour, so we saw all what we want. The guide had a verty good knowledge. He could answer all our questions. we was very satisfaied.